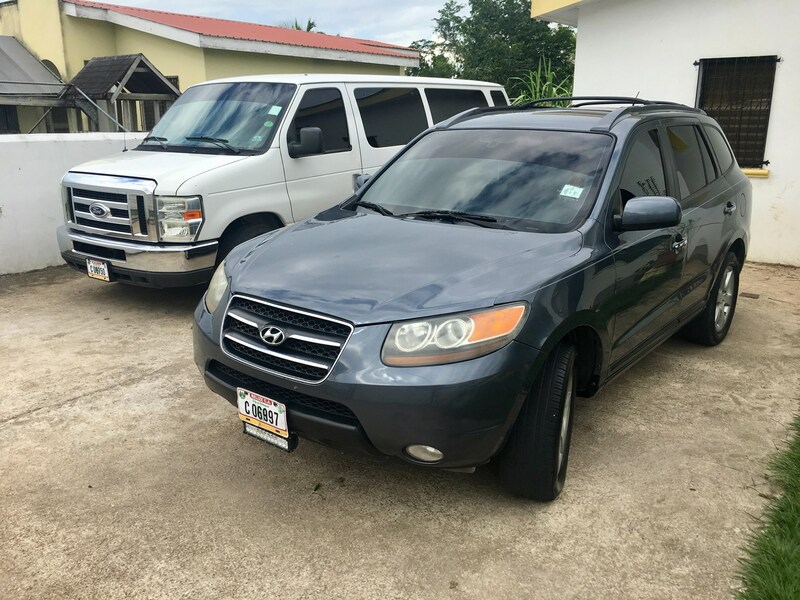 G&W Enterprise is a registered ground transportation company that offers affordable, efficient and dependable services in Belize. 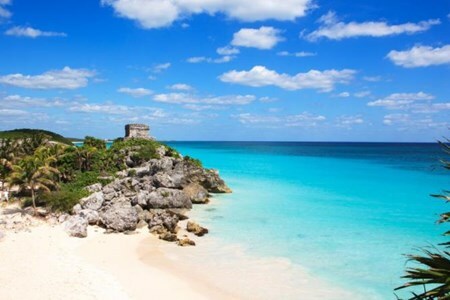 These services include (but are not limited to): airport pick-ups and adventurous tours. We pride ourselves on being professional, on time and welcoming to visitors. 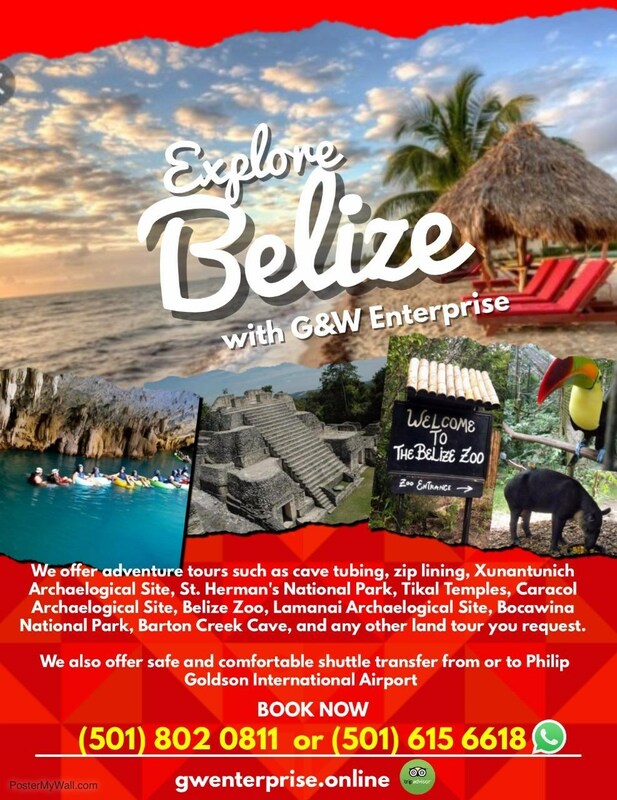 Our exotic tours include Thrilling zip line adventures, ancient Maya temple climbs, colorful fauna on their simulated natural habitats at the incomparable Belize Zoo, a variation of chartered trips to satisfy your desire, and educational school trips throughout beautiful Belize. 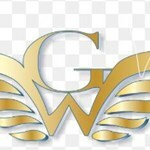 Additionally, G&W offers luxurious and comfortable van rentals upon the availability of vehicles. Contact us today to book your next adventure! 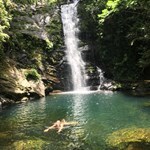 Actun Tunichil Muknal is located in the Cayo district at the Tapir Nature Mountain Reserve. We will need to take 15 minutes to ride to the village of teakettle, then we drive south/west ... morefor about 35 minutes. We will arrive at the parking lot of the reserve, guest will be instructed to use the restroom first and then we will provide guests with their helmets, lights, and light vest if necessary. We will hike for 35 minutes passing through three rivers in the Tapir Nature Mountain reserve after which we will arrive at the entrance of the cave. 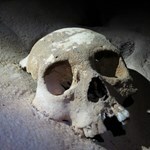 Our knowledgeable guide will provide you will an introduction to the cave. We enter the cave for a three hours tour. 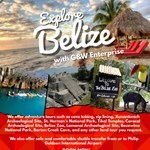 We will have Belizean lunch, rum punch, desserts, sodas and water at the end of the tour. All guest change and we return. 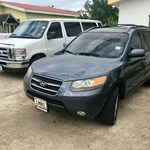 This is a combo tour of two various places in southern Belize. Che’il Mayan Chocolate factory is located in Maya Center Village on the Southern Highway. It’s a 25 min ride from Hopkins. 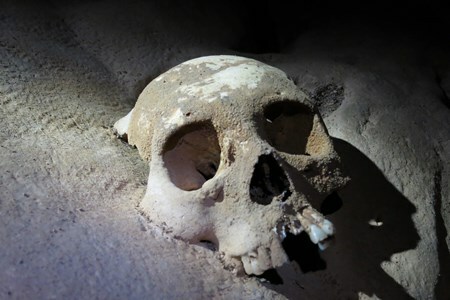 ... moreHere you will have the opportunity to go on a two-hour tour, which includes a hike at the cacao farm where you can have a taste of the bean and get a chance to see wild birds, flora & fauna. 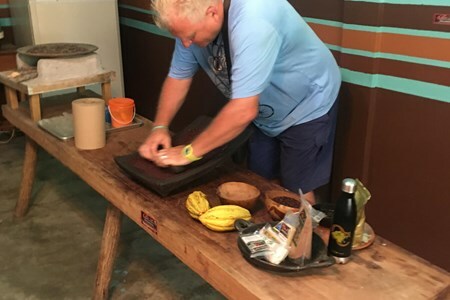 The second leg is the traditional Mayan Chocolate process making and a wonderful ending of eating your personally made chocolate. 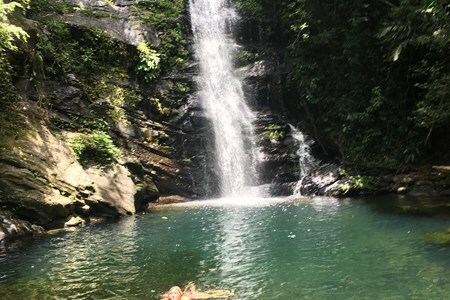 The second part of the tour takes you off-road through the rainforest and up into the Maya Center Village hills to the beautiful Maya King Waterfall. Driving right up to the entrance of the fall, it’s a short walk up some stairs to dip into a clear refreshing natural pool. Spend the time relaxing under the falls or just swimming in any of the three pools at the park. 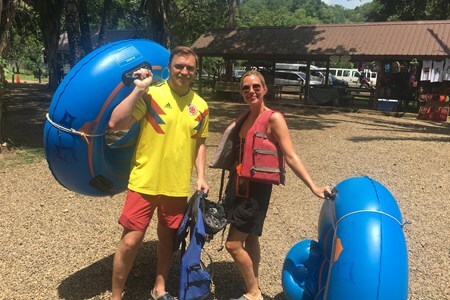 Lastly river tubing for 1 hour 30 minutes. The journey is a private shuttle in our comfortable air-conitioned vehicles. 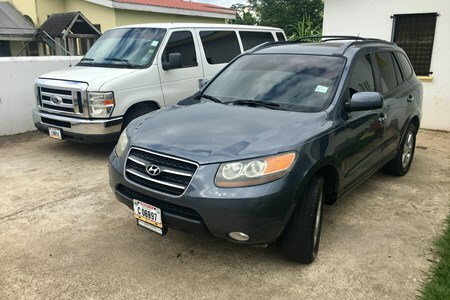 The journey is approximately 1 hour from the international airport to Orange Walk town. The journey from Belize city/water taxi would be 15 minutes longer. The drop off can be Orange ... moreWalk town or surrounding areas. We feature well-kept air-conditioned vans and SUV for your service. The tour is a full day package. A two-hour drive to Bacawina national park for an adrenaline rush zipline adventure. The zip line will last for 1 hours and we then make our way to ... morethe chocolate farm. At this farm, you will get an educational breathtaking an experience of how chocolate is made. This experience will last for 2 hours. finally why not cool off at the Maya king waterfall. The fall has a various level situation for your ability to explore the refreshing water of the falls. This full day package is 80 miles from Placencia. 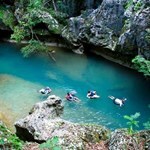 This is beautiful sightseeing and educational ride through the hills of Southern Belize. You will have the opportunity to experience ... moreone of our wonders of the world " our magnetic hill" and our sleeping giant mountain along the way the day will start off with our breathe taking zipline. They are 10 lines of the zip line and should take 1 hour 30minutes. 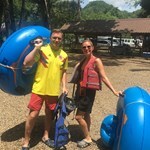 Thereafter we will hike for 45 minutes in the dense forest of Belize and will tube down the river that takes 2 hours. Lunch will be provided and then depart to Hopkins. This full day package is 100 miles from Placencia. 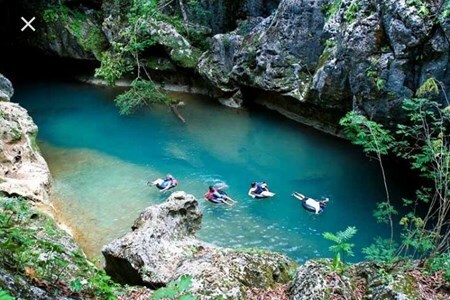 This is beautiful sightseeing and educational ride through the hills of Southern Belize. You will have the opportunity to experience ... moreone of our wonders of the world " our magnetic hill" and our sleeping giant mountain along the way the day will start off with our breathe taking zipline. They are 10 lines of the zip line and should take 1 hour 30minutes. 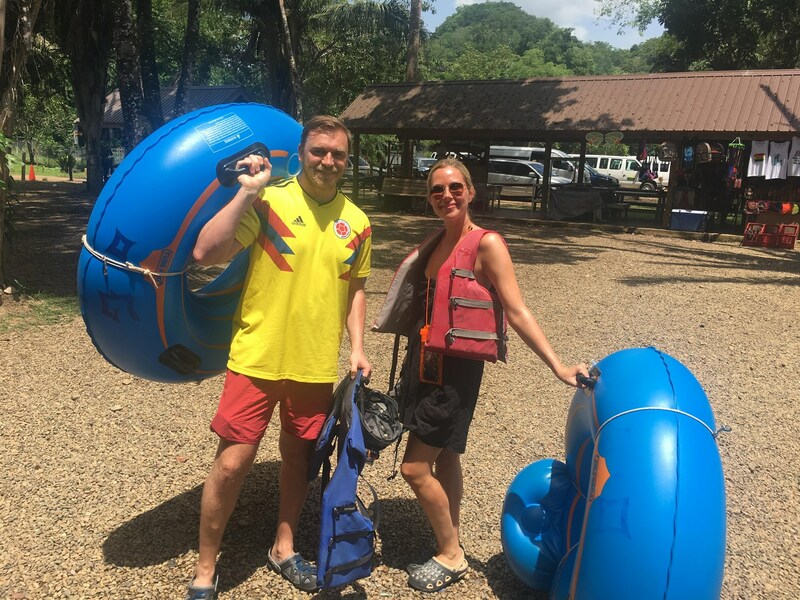 Thereafter we will hike for 45 minutes in the dense forest of Belize and will tube down the river that takes 2 hours. 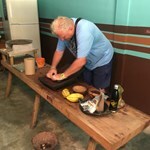 Lunch will be provided and then depart to Placencia. We feature reliable safe and comfortable service in our well kept 14 seaters van and SUV. We feature well-kept air-conditioned vehicles for large and small groups. Book with us today to ride in class. Cannot recommend Gershom more highly! Everything from his rapid and incredibly helpful communication in booking, to helping getting our bags into the hotel was perfect! He was there waiting for us when we landed, his vehicle is immaculate and huge (plenty of room for big groups) and the trip was very comfortable. 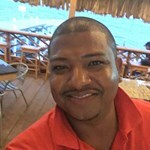 Gershom went above and beyond to ensure the start of our Belize trip was perfect. He ... more took us to a local store to pick up bug spray, stopped at cool places on route for photos and gave us a very knowledgeable tour of the areas we passed through. He even provided water and snacks for the journey! Will definitely book again when we visit again! Thanks Gershom! We had never used this site before so we extremely apprehensive but Gershome was there as soon as we landed. His service is extremely professional and it was a great journey to Hopkins bay with this geographical and historical knowledge. Highly recommend, Thankyou! Thanks for doing business with us. It was a great journey. Do enjoy Hopkins. Thank you!! !